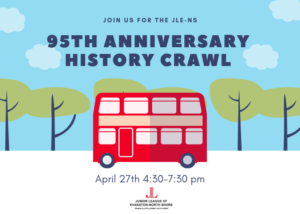 Join us for a walk back through JLE-NS History and create some history, as well. Our coach will await us in the back parking lot of the Community House, Winnetka. Our coach allows for BYOB. Some water and snacks will be provided. First group picture, of many, will be taken exactly at 4:30pm. Our coach leaves promptly at 4:35pm. Many stories await…even an unveiling. We will present gifts to a couple of our community partners, as we make our way. We will end by 7:30 pm back at the Community House, Winnetka…but for those interested, the Crawl will informally continue at Little Ricky’s. Significant Others and Guests are welcome and encouraged. Cost is $35 per person. Please purchase your ticket(s) by Thursday, April 18th by clicking here.